The new way to learn guitar scales. Knowing scales is vital to expanding your capacity to solo on the guitar. 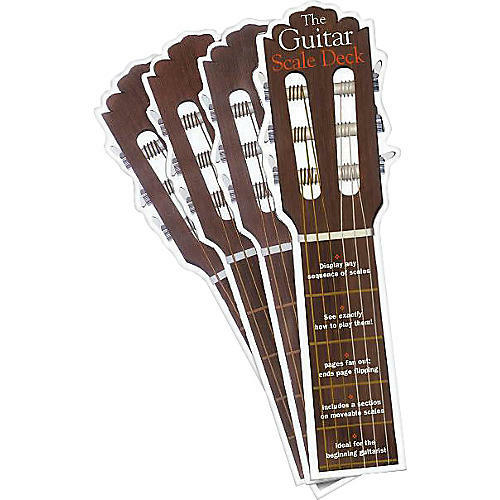 The Guitar Scale Deck is an effective way to learn guitar scales. The wonderful and original design allows you to display any sequence of scales, and see exactly how to play them. Simply fan out the pages, there is no need for flipping or turning pages. Including a section on scales and arpeggios, the clear presentation and intuitive design mean that it is perfect for beginners and as a refresher for more experienced players. Small and slim enough to fit in the back of your amp or in your guitar case so you should never leave home for a gig without it. Improve your soloing quickly by learning scales easily. Order today.